Winthrop replies to Berry's plea that she cannot do any more for the Berry Schools. Winthrop encloses a check for $2500 in support of an endowed scholarship and a day of memory, October 1 - her mother's birthday - for her mother. 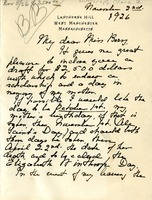 Winthrop requests that the scholarship be used for a boy, rather than a girl, and asks if Berry will consider placing a photograph of an alter piece placed in St. John's Church in honor of her mother somewhere at the school. 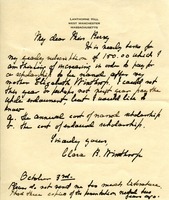 Winthrop is interested in increasing her scholarship gift in honor of her mother, Elizabeth Winthrop.